We’re starting a six-part series on starting a blog and how I built my business to over a hundred grand in four years. I’ll not only answer the question, How Do I Start a Blog, but will show you how to set it up and be successful. I’ll show you a step-by-step to start a blog and how I make money on seven income sources. I’m revealing the secrets to picking a blogging idea and growing your website. 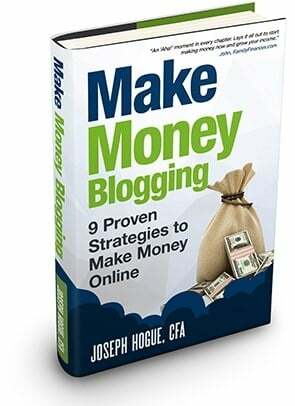 I’m excited to get started on this series, blogging has changed my life and I guarantee it will give you something that can make a little extra money or become a full-time money maker. 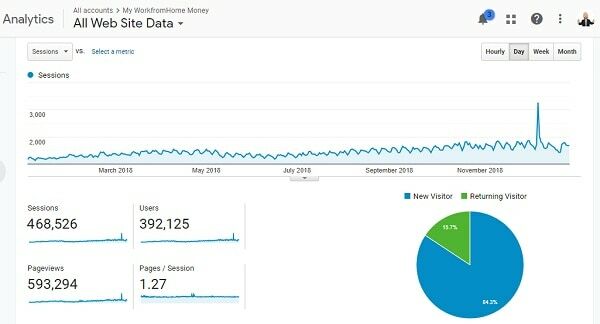 I just started my Work from Home blog a few years ago and already reach almost 400,000 people a year. Not only does this provide a huge community to share with but I think most people don’t understand just how big a business it can be. 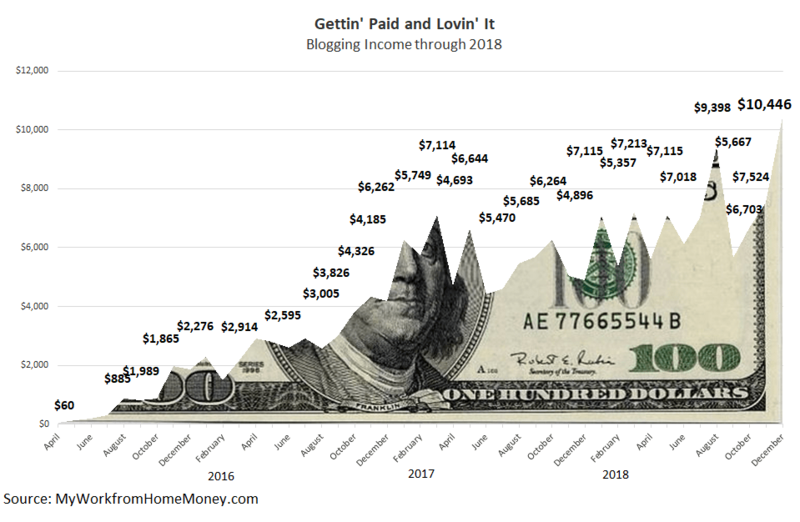 I won’t tell you that blogging is the easy passive income everyone makes it out to be. It’s a business and I had to build it from the ground up but it’s a business that grows like you wouldn’t believe. In less than four years, I’ve grown the business to over $100,000 a year and broke $10,000 a month in 2018. You see from that chart though that it didn’t start that way. You have to get started first and that’s what we’ll talk about in this first video. I’m going to give you a step-by-step to picking a blog topic, starting your website and what you need to set a blog up for success. 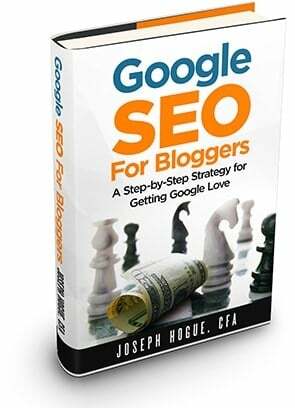 I’ll walk you through all the way so that anyone can get started blogging. The rest of the series will give you everything you need to make that money from writing posts to getting the word out, all the ways I use to make money and the biggest blogging challenges. 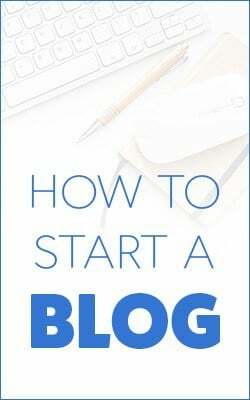 Let’s get to that process of how to start a blog. It’s going to be an easy, procedural video today and I’ll screen share exactly what you need to get started. I’m posting the videos over the next week but you can get a free checklist to everything we’ll cover by clicking here. One of the first questions people ask about starting blogging is, well, what should I blog about? It’s maybe more important than you realize for a couple of reasons. First, you’re going to be doing a lot of writing and talking about this subject and it could be a business that lasts decades. You definitely want it to be in something you enjoy talking about and learning. Also though is some topics are just more profitable than others. There’s a saying in online business that the money is in health, wealth and love. It’s those three major topics; health and fitness, personal finance and relationships where the most ad dollars are spent, where the most is spent on courses and just where people are most willing to spend money. Of course, there are a lot of narrower topics within these larger ideas and you don’t want to start a blog on something as broad as personal finance. You want to narrow what you’ll be talking about further to a specific category in personal finance, maybe saving money or investing. You can also narrow your blog by your audience, so speaking to a specific group like stay at home moms or families or millennials. This narrowing is called your niche and it serves two purposes. First, it brings you closer to your readers because you’re talking more directly to them and their specific needs. Also though, this is going to make your blog an authority in that specific topic. Google will see that you’re building authority in one area and will rank you higher and your visitors won’t have to sift through dozens of unrelated articles to get more of what they came to your site for. So we’ve got a topic that we enjoy and a niche within it that’s going to make money, now is the step of picking your website name and getting it online. These are technically two steps but I’ve got a solution that will take care of both in one that I’ll share next. Now in the good old days of 2005, it used to be that you could get a boost on Google if your website name included keywords. So you got all kinds of blogs like how to make money.com and passiveincome.com but now your domain name really doesn’t matter as much. That means you can pretty much name your site whatever you like, something that’s easy to remember and spell. The one thing I’d caution about here is putting your name in your domain. 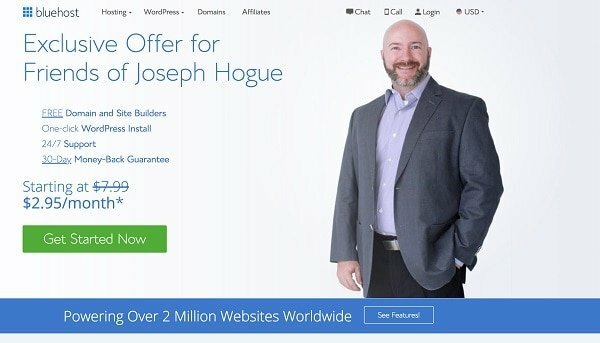 The problem here is that if you ever want to sell the website, it’s obviously going to be harder to find a buyer if everyone knows the site as joeschmo.com. Picking a blog name that’s available can be tricky so I’ll use the domain name checker on bluehost to see if something’s available. If it’s not then the site will make a lot of suggestions here and I wouldn’t necessarily go with any of these but they can give you some ideas that you can try out different combinations of adjectives and other words. How Do You Start a Blog Online? Now to get your blog online you’ll need to register that domain, your blog name, and you’ll need web hosting. Web hosting is just a company that holds your website on its servers and then delivers it across the internet to readers. For both of these, I recommend Bluehost and have actually negotiated a special deal if you use the link below. I recommend Bluehost for quite a few reasons and it’s the host I’ve started all four of my blogs on. First, with bluehost, you get your domain registered for free which saves you ten or fifteen bucks right there. It’s also one of the most inexpensive web hosts and offers a lot of freebies that we’ll look at in getting your blog set up. I’m going to walk you through setting up your blog but really it takes all of about five minutes and Bluehost makes it extremely easy. If you click on the link here you’ll see our special discount page here and you’ll see the offer we’ve set up which includes that free domain name, round-the-clock support and a money-back guarantee for less than three bucks a month. This is why I love websites as a business idea. For less than that mocha-coca-china at Starbucks, you can get your website up and running for a month and making money. So the first thing we see are these three pricing plans and honestly this first plan is probably more than you’ll need to start out. Fifty gigabytes of storage space is huge, you get the free security certificate and everything we’re going to be talking about. The two things that I like and why I ended up on the Plus plan were this unlimited websites, since I wanted to start a few websites at once, and then the $200 in marketing offers. Understand that you can always upgrade later so you might just go with the basic plan and see if you need more later. We’re going to select that basic plan and next they’ll ask you to pick a domain name which we just talked about so you just enter your site name in here. You can change this from .com to others like .net or .biz but I would recommend sticking with the .com type. A few things here on the account signup page, most of this is just your contact information and payment so all pretty easy though I will point out some of this package information. First here is you can change the length of your plan from twelve to 36 months. Even the shorter-term plan is pretty inexpensive but I always like to lock in the biggest discount. This business is something you’re going to be building and making money off for years to come so getting that discount is always nice. Some things they try to upsell you on here that I usually just check off. The domain privacy information isn’t really that big of a deal. I’ve got my home address on mine and have never had a problem or you can use a PO box. This site backup plan, you’ll be able to backup your site with free plugins we’ll use so we’ll click off that as well and save you the three bucks a month. Then we’ll uncheck this sitelock security because this isn’t really something you need to get started either. So this brings my total to just over a hundred dollars which remember is for three years of hosting. Basically you’ve got your site online for three years so I’m going to enter in my information and click submit. You’ll get a confirmation email and next be prompted to create a password for the blog so not your birthday and no pet’s names please. We’ll just use the auto-generated passwords for now. Next it’s going to prompt you to pick a theme for your blog. This is like the layout or design of your blog what people see, so it’s hugely important. Bluehost will show you the free themes to get started so we’ll just pick one of these. That’s basically it to get your blog online. It used to be that you had to install WordPress but now Bluehost is doing all this automatically for you. Your blog will be in a temporary status at first and just show a “Coming Soon” page so when we click through then we can click to “Launch Site” and take it live. Here we’re still on the Bluehost panel which is like a behind the scenes dashboard for your Bluehost account. You’ll rarely use this so we’re just going to click to Login to Wordpress, the behind the scenes for your blog itself. And here’s WordPress, once we x out of all these notices on the right, you’ll see the left-side menu which is how you’ll make changes to the blog and manage it. There’s some basic setup you’ll want to take care of like changing your site title and tagline in Settings and then General Settings. You can also try out a few different looks for your blog by going to Appearance and then themes to let you pick some of the other free themes. Once you’ve got your website up and running, there’s something that’s going to make your life a whole lot easier called plugins. These are computer programs that you can install onto your website to do a specific task like keep you from getting lots of spam comments and making it easier for people to share your site on social media. To add a plugin to your blog, just click plugins in the left menu in WordPress. You’ll see all the plugins on your website and can click Add New to search for ones you want. When you find one, you’ll click Install Now and then Activate to get it working. There are more than 30,000 plugins available on WordPress but understand that having too many can slow down your website. There’s no consensus to how many is too many. Whenever you decide on whether to add another, just ask yourself if you really need what it offers. Let’s look at some of the plugins I use that will be critical to starting your blog. Most of these are free plugins though they might have some premium levels. When it comes to paying for plugins, I only have three plugins I pay for and only consider one absolutely necessary for beginner bloggers. First is Akismet, probably the most widely used plugin on WordPress. This one filters obvious spam comments so you don’t spend hours a week deleting crap from your comment section. It’s free and the first plugin everyone needs to install. Next is Broken Link Checker. Now a broken link is anytime you click on something online and all you see is an error page or a 404 page. This is obviously super annoying for your readers and Google will actually ding your site if it finds too many. So you install this broken link plugin that checks all the links on your website to make sure they go somewhere. A word of warning though, this one can slow down your blog if you leave it on because it’s constantly running through checking your links. Instead, what you want to do is install it but only activate it for maybe a weekend each month. Let it run for those three days or so to check your links, fix any broken links it finds, and then deactivate it so it doesn’t run continuously. Next is the PrettyLinks plugin, easily my favorite plugin and the only premium plugin I think every beginning blogger should have. There are two things this plugin does. First, it let’s you create a link you want to put on your blog. So if you’ve ever hovered over a linkable text and seen just a jumble of letters, with PrettyLinks you create a link that starts with your website name and looks much more professional. More importantly though, the plugin makes it easy to manage all your links. You can change out the direction or the target where the link goes when someone clicks. This is hugely important for products or affiliates. You might link your course or an affiliate on a dozen or more pages on your blog but if you ever want to change the link then you have to go to each page and change the link. With prettylink, you just go into the plugin and change the target and it’s automatically changed on all the pages. The plugin also shows you how many people clicked on that link and from which page so it’s a great tracking tool. The next plugin I recommend is the Shareaholic social sharer. If you’ve ever noticed those social share buttons on the left side or top of a blog post, it’s probably shareaholic. This just makes it easier for readers to share your article and gets you more traffic which is huge for new bloggers. One feature I like about Shareaholic is that you can set it to float where it will stay showing on the screen even as someone scrolls down the page. Now you’ve got your blog set up and you’re ready to start posting, getting visitors to your blog and making money. Next week, I’m going to show you how to write a blog post that will get noticed, not just by visitors but by Google to rank in search. I’ll be revealing secrets I’ve learned to make writing easy for anyone so make sure you check that out. 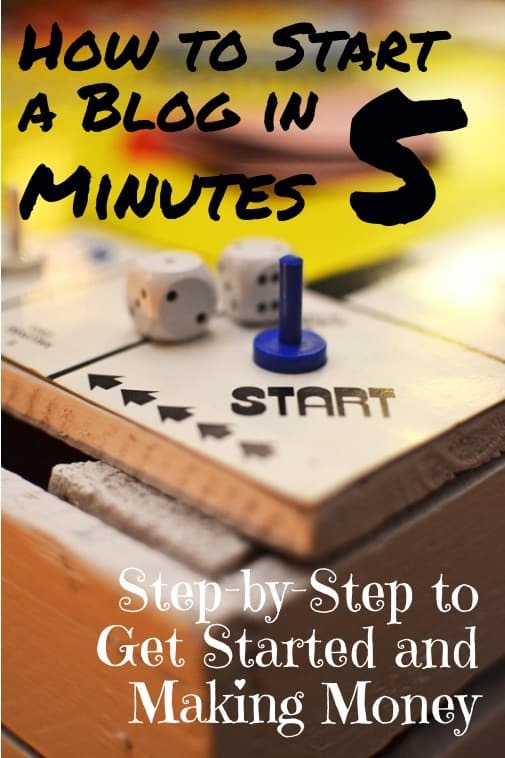 Getting started blogging is easy and you can get a blog online in less than five minutes with Bluehost. 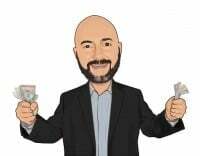 Be sure to take advantage of that special rate I’ve negotiated with Bluehost for your discount pricing and extra features. Subscribe to the channel so you don’t miss any of those free blogging course videos.